Beijing Sunday unveiled a new package of policies to facilitate Taiwan people's wider access to the mainland in education, employment and investment sectors. Addressing the closing ceremony of the third Cross-Straits Economic, Trade and Cultural Forum, Vice-Minister of Education Yuan Guiren announced that universities in Taiwan are encouraged to recruit students from the mainland. About 2,300 Taiwan students studied in mainland universities last year, and a quarter of them enjoyed scholarships. But restricted by the present policies on the island, mainland students are only allowed to study in Taiwan universities for no longer than four months. "We will help the students go to Taiwan for study, and continue to facilitate personnel exchanges," Yuan said. Residents from Taiwan are also encouraged to participate in 15 categories of professional qualification exams on the mainland. They include exams in the healthcare, accounting and economy sectors. Vice-Minister of Public Security Meng Hongwei also announced at the ceremony that three more cities - Guangzhou, Qingdao and Wuhan - will join another eight cities authorized to issue valid passes to Taiwan residents entering the mainland starting May 15. The eight cities are: Haikou, Sanya, Xiamen, Fuzhou, Shanghai, Shenyang, Dalian and Chengdu. In addition to Beijing, Shanghai, Guangzhou and Xiamen, six more cities Chengdu, Hangzhou, Nanjing, Shenzhen, Dalian and Guilin are entitled to accommodate charter flights cross the Taiwan Straits during festivals, Gao Hongfeng, vice-minister of the General Administration of Civil Aviation, said. Taiwan airlines are encouraged to form joint ventures with their mainland counterparts and invest in airport construction, Gao said. Also, shipping giants from Taiwan can invest in wholly owned shipping and container transport firms and operate ports and highways, Vice-Minister of Communications Xu Zuyuan, said. Taiwan investors have poured about $100 billion into the mainland over the last two decades. Communist Party of China (CPC) chief Hu Jintao has called for closer personnel, economic and cultural exchanges between the mainland and Taiwan to help curb Taiwan secessionist moves and maintain peace across the Taiwan Straits. Hu, general secretary of CPC Central Committee, made the appeal during a meeting with participants at the third Cross-Straits Economic, Trade and Cultural Forum over the weekend. "It is the common will of the people and also a prevailing historical trend to promote economic and cultural exchanges and cooperation, improve the well-being of the people across the Straits and boost the great rejuvenation of the Chinese nation," Hu said. He said the mainland's robust economic growth had offered more opportunities, stronger impetus and better conditions for cross-Straits economic exchanges and cooperation. About 500 participants from the mainland and Taiwan attended the forum to exchange views on cross-Straits direct flights, cooperation in education and tourism between the two sides. While attending the opening ceremony of the forum on Saturday, China's top political advisor, Jia Qinglin, also warned against the "escalating danger" of "Taiwan independence", saying it was "the most serious, dangerous and urgent problem threatening peace and stability across the Taiwan Straits". Jia, chairman of the National Committee of the Chinese People's Political Consultative Conference, said the leaders of the Democratic Progressive Party, Taiwan's ruling party, insisted on the radical policy of "Taiwan independence" and kept provoking the mainland with secessionist remarks and activities. Jia reiterated that the mainland would continue to show the greatest sincerity and exert the greatest efforts to promote the peaceful development of cross-Straits relations and achieve peaceful reunification. "But we will never tolerate 'Taiwan independence'. And never will we allow anyone to separate Taiwan from China by any means," Jia said. "We have the will, the capacity and the resources to contain 'Taiwan independence' as well as any serious 'Taiwan independence' incidents," Jia said. 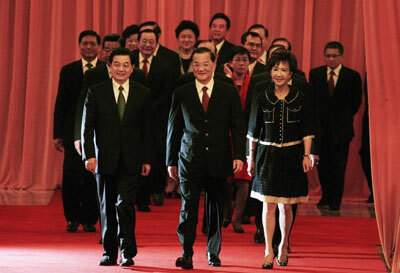 Attending the same ceremony, Kuomintang (KMT) Honorary Chairman Lien Chan urged Taiwan authorities to stop cutting the island off from the mainland and to open negotiations to boost cross-Straits ties. While the mainland has opened to the entire world, Taiwan authorities continue to put up barriers to the island's access to the huge market, said Lien. "This has caused great damage to Taiwan," Lien said. Taiwan can only pursue its development through extensive exchanges and cooperation with the mainland, he said. Lien said the series of forums and seminars on cross-Straits economic, cultural and agricultural exchanges over the past two years jointly held by the CPC and the KMT have helped improve the well-being of the people across the Straits, especially the Taiwan people. The KMT will continue to work as a bridge to push forward cross-Straits relations through dialogs and consultations, Lien said while addressing the forum.